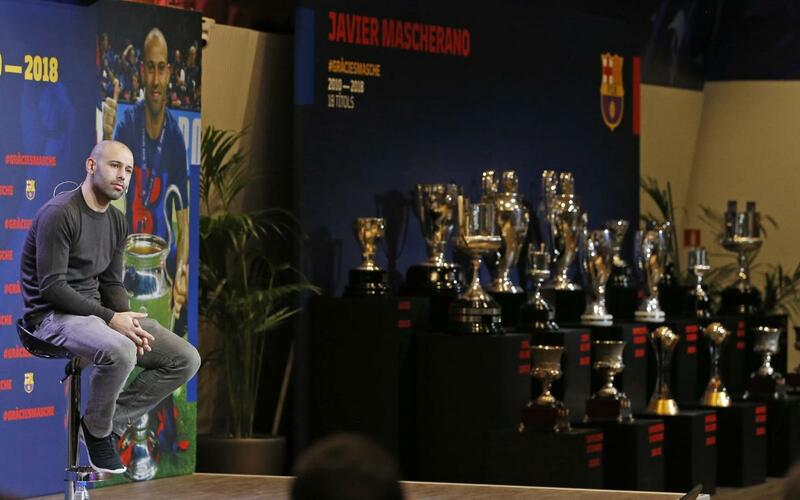 “That the people that you work with every day value you is the best motivation that you can have.” Words from Javier Mascherano that perfectly define his stature as a person and as a player at FC Barcelona during the farewell event held for the Argentinian at the Auditori 1899 at Camp Nou attended by president Bartomeu and first team players past and present. The defender, visibly emotional, explained the reasons behind his decision to bring down the curtain on his seven and a half year career at FC Barcelona that saw him claim 18 trophies with the Club. “I fulfilled a dream coming to Barça and now it is time to wake up,” said Mascherano. “My time here lasted more than I thought, seven and a half spectacular seasons with a fantastic group in the dressing room,” he continued. Mascherano did not highlight any particular trophy of the 18 he has claimed as a blaugrana but he did stress the important of his famous tackle on Niklas Bendtner in the Champions League quarter-final at Camp Nou against Arsenal. “That moment marked a before and after in my relationship with the fans. Up until then it had not been easy for me but that tackle gave me the confidence to bring things to the team. There are moments that are important to you and that one was an important positive for me,” revealed the Argentine.